New York is now one of the world's safest cities, but in the '60s, '70s and '80s it was in rough shape. Answer these questions about that period. What words are missing from this headline? The city resolved the financial crisis in Q1 when the state's governor appointed the Municipal Assistance Corporation to manage the city's finances. Name either that governor or the MAC's chairman, a partner at Lazard Freres who was later appointed ambassador to France. Anyone who ever kept a few bucks in their shoe in case they got mugged knows how rough the subways could be in those days. What group, wearing distinctive red berets, was founded to try to combat subway crime? What weapons did the subway vigilante claim he had been threatened with? In 1988, a park in Alphabet City which had been occupied by homeless squatters was raided by police, resulting in a full-on riot after the police attacked both the crowd and bystanders. In what park did this happen? On March 13, 1964, a young woman was stabbed to death on the street while dozens of people allegedly watched and did nothing. Who was the victim of that crime? The triangle at Broadway and W. 71st St. is officially known as Verdi Square, but it went by a different name in a 1971 film starring a young Al Pacino. What was it? The brutal assault on a jogger in Central Park in 1989 introduced a word into New Yorker's vocabulary, used to describe an unprovoked gang attack on strangers. What was that term? OK, so it wasn't all bad in those days. 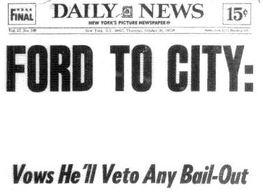 Many major cities saw rioting after the assassination of Martin Luther King Jr., but New York was mostly spared after what incumbent mayor went to Harlem to calm tensions? During Ed Koch's three terms as mayor, he often asked people to rate his job performance. What question did he ask? Correct NYC tabloid spelling is required. The city was not helped by a reputation for political corruption. Perhaps the most notorious case was that of the longtime Queens borough president who committed suicide a month after his resignation while under investigation for taking kickbacks. Who was he?